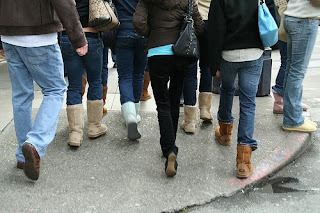 Girls, Moms, Friends, Ugg Boots wearers...we need to unite! Well, actually I need you to unite. Before you go any further on my post check out Shay Robbins' blog (just click on that) and then come back to read on. Okay, so my husband just doesn't get it. I will be honest...I am usually not this trendy, fashionista. I'm just not. I'm like a Target, T.J. Maxx, goo-roo! But not a fashionista...but I have to admit that I have wanted a pair of size 7, chestnut, classic short Ugg boots. I know they are not like super cutesy...but nonetheless I would LOVE a pair. Shay just is hysterical about his dislike! I have been searching on ebay for like months (okay, like almost 1 1/2 years :0! And still haven't been able to afford those crazy things...even on Ebay. But I'm not giving up...even though Shay is fighting hard for me not to even get these crazy things! It's comical in our house right now...about Uggs! So funny! Shay's argument to me is that my feet will get to hot. (I do sleep with my feet out of the covers at night...but again, I think I will like them when it's so cold outside). He might be right...but I obviously won't wear them in July. I just would love to have them for November-January...for the nights we go playing in snow in Cabot, AR with my niece and nephew...for the days when I want to look put together for the office but yet be comfy-cozy! I have to admit...I just want a pair! 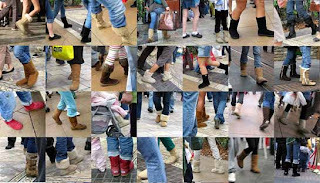 So girls, unite and leave as many comments on Shay's blog about why Uggs are so great and so awesome! Moms too! Anyone! www.shayrobbins.org is the web address or just click on his name in this post. Girls we need to unite! i absolutely loved this post!!!! omg the best i'm wearing my uggs right now! I was just having this same argument with one of my guy friends like yesterday. MacKenzie loves Uggs too, but I couldn't go for the pricetag. Do you know about BearPaws? They look just like Uggs without the Uggs label or pricetag. We got them at Off Broadway shoes for$39 on sale from $49. MacKenzie says they are very warm and comfortable. FYI, the Target version may be inexpensive, but they are cheap...the inside lining curls up. Ashley Ashley Ashley... Uggs dont roll with the snow amazingly. Not playing in the snow at least. Walking on their fine. But they are amazing for the cold i have them and in the freezing days walkin to class here in Lawrence, they have worked MIRACLES keeping my body temperature higher. They might not be the cutest, but i swear by mine i need new ones too! Great for winter. they have some great deals on everything designer and check for authenticity but i think you might find it there. Hope i helped. Miss ya! You definitely need a pair of Ugg boots! they are so practical for the fall/winter. 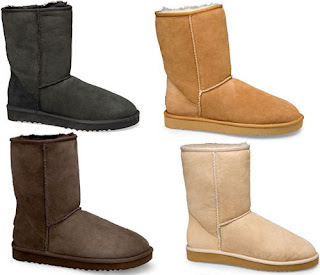 you can get real uggs, but I think that there are some great knock off Uggs out there that look the same, and are MUCH cheaper. check out my website for a link to a company that sells awesome knock off uggs.